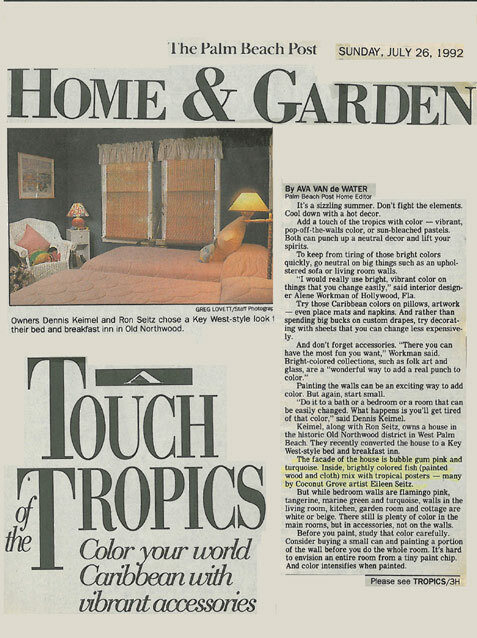 Home and Garden Magazine wrote an article about a very tropical home in the Old Northwood district in West Palm Beach. The two fellows who owned this property converted the house into a tropical oasis Bed and Breakfast . They painted the extrerior a bubble gum pink and decoreated many of the walls throughout the home with Eileen Seitz’s prints. A beautiful place, where many a weary traveler could relax and unwind.